I recently purchased Smashbox ‘s Contour kit after deciding I wanted to use a professional palette that was designed to define and highlight my skin. Some of my favorite celebrity makeup artists have this palette in their kit so I thought it would be worth the investment to add it to mine. When I opened the box I was impressed that it came with a Signature Smashbox red angled contour brush to be used with the palette. I typically don’t use brushes that come along, so it immediately went into my unused brush pile. This three-pan mirror palette is small and perfect for travel as it easily fits in your hand. It is actually about the size of an encased iphone. The packaging is a glossy and includes a small sticker cheat sheet that offers detailed instructions on where to apply the product. It’s attached to the mirror so you don’t have to worry about losing it. 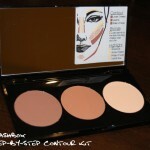 The three colors – a cool-toned brown for Contour, a warm tan Bronzer and an ivory for Highlight – make up the palette. The colors are true and I recommend you start lightly because you can build up the intensity if you need to. I’m not a huge fan of the bronzer provided in the kit because I prefer a bit of shimmer on my MAC NC42 skin tone, but I definitely use the contour color as well as the highlight (which looks very beautiful in pictures). I have to admit that this palette really help to define and sculpt the face. I was instantly impressed. The powders have great blending ability and last throughout the day. I recommend this palette to anyone with light to medium toned skin looking for a fool-proof way to contour and sculpt their face. Smashbox Step-by-Step Contour kit can be purchased for $45 at Nordstrom and Ulta.